China is on pace to surpass Germany as the world’s most popular country code top-level domain (ccTLD) — in about two or three months. It’s no surprise that China would surpass Germany. What is surprising is China’s rate of growth, as visualized in the graph. Germany currently leads with roughly 11.5 million .de registrations, but China recently surpassed the 10 million mark, and is adding 20,000 registrations per day. Keep in mind, this 10 million statistic includes all permutations of .cn, such as gov.cn and edu.cn. 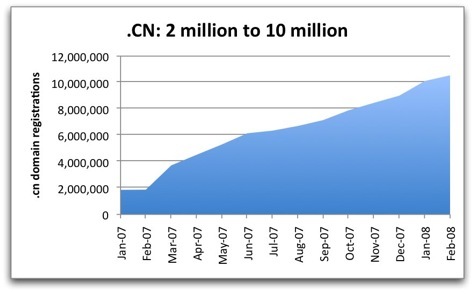 The .cn domain registered by companies inside and outside of China, such as Intel.cn and Google.cn, accounts for 6 million of the 10 million registrations.